Today’s Valentine’s Day instalment comes from our guest writer, Michael Allen, the webmaster of 28 Days Later Analysis, an informative website dedicated to news and reviews in the independent horror entertainment scene. 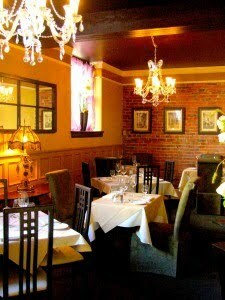 Camille’s Restaurant is a fine dining establishment located in the heart of Victoria. Situated just a stone’s throw away from where Judge Begbie (The Hanging Judge) sentenced his court attendees, Camille’s is situated near the inner harbour, in Bastion Square. This restaurant has been cooking in this locale for over twenty years and the excellent dining experience therein is widely known. The food is exceptional; however, so are the prices! Also of note, Camille’s offers two different times for dining, including: 6:00pm and 9:00pm sittings. So, your chances of finding a dinner table are doubled. Once seated, you are treated to an incredible atmosphere: full of candlelight, sparkling wine glasses and jazz infused musical selection. The service here is formal and inviting. Quickly, you are seated and servers are shortly asking if they can take your coat. Your first drink is brought in short order and the wine list is diverse. Wines are available from across the globe and choose your drink wisely to pair with your pan seared Tuna Tataki. If mostly raw fish is not to your taste, there are several other appertifs to explore. However, your choice of entrée is slightly limited. The menu changes daily, so Chef David Mincey focuses you in on several meaty dishes and there is at least one vegetarian meal available, for those interested. This aspiring food critic chose the Lamb Trio! Your lamb is prepared as thin cuts on pieces of yam and potato. The other styles of lamb include a breaded version and a homemade ravioli laced with gravy and strips of lamb meat. This foodie was tricked into eating the kale by a feisty date, but likely these pieces serve as a garnish only. However, each of the three types of lamb are mouth watering and each is full of diverse flavours. Desserts of chocolate cakes or specialty coffees are offered later. And the only elements that dampen this evening are the slightly dungeony feeling of the setting and the price of a sitting. Judge Begbie’s presence can still be felt at Camille’s, as the restaurant is broken into two lower level sections. The back room is warm, but enclosed; there are few open windows here, but there is no view to speak of. Also, a $12 dollar appetizer, two entrees at $35, two glasses of wine at $12 a piece, along with a specialty coffee will start to lighten your wallet. This sometimes savvy diner brought a $20 coupon to ease the financial burden. Still the check was well over a $100 and a gratuity of 15% with tax will put your check closer to $150. So, Camille’s Restaurant is not a place for a starving student and instead, this a dining experience for professionals, within the community. For this food critic, this was one of the best fine dining experiences in the city, outside of the Bengal Lounge. This experience felt much like a treat and the personnel at Camille’s confirmed this thought with their warm service. This dining establishment is recommended for those out for a special meal. Not even Judge Begbie’s ghost could hamper this encore worthy setting! (portions are quite small, while the presentation is superb). (this restaurant is likely in the top five for expense). This entry was posted in Food and tagged Alcohol, Bastion Square, Guest Review, North American. Bookmark the permalink.